I got to Portland in a cold and snowy drive from Burlington the night before. Similar geographic makeup to Burlington, in that both are the larger metropolitan cities in a rather rural state. Portland is about 1 and a half times the size of Burlington (66, 000 compared to 42,000 respectively), and so there’s a slightly larger group to pull from when it comes to recruiting and bringing people into the conversation. Maine Ultimate is famously known in the region for their winter Clambake tournament which is a mixed ultimate tournament that then eats lots of clams and lobsters in the evening cooked over a massive outdoor fire pit. It’s also a fundraising tournament for the Maine Special Olympics. Our conversation started off with a get to know you game that explored why we were present and what we knew about equity, as well as our favorite pie because it was Pi Day - shout out to Caitlin O’Connell and Andrew “Bond” Applegate for making all the pies! 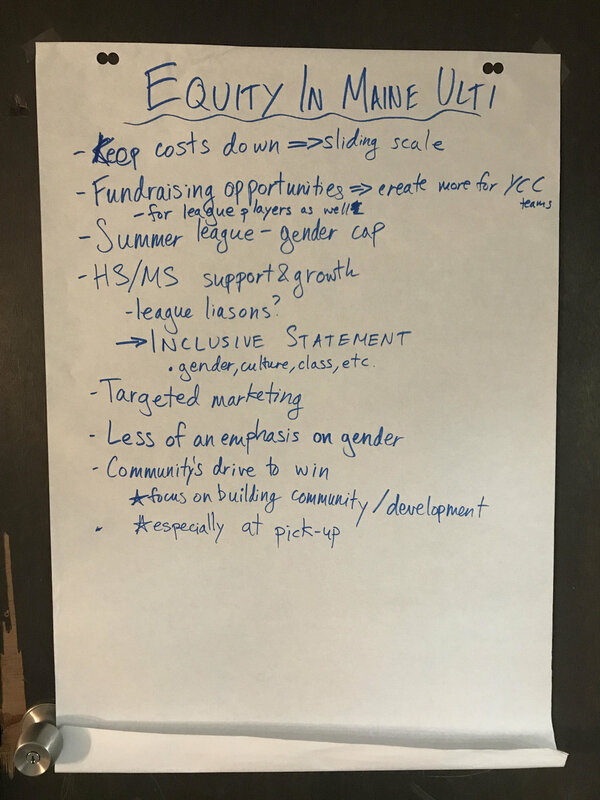 Next, we explored what does inequity look like in Maine ultimate and what could an equitable response look like. One thing that stood out was that there was only one man there who consistently plays open at the highest level, calling out almost the clear lack of diversity from play experience in the room. A lot of this tour has been an interesting combination of who has been there and who wasn’t. Another topic centered around reducing costs for players to make it more accessible for more people, particularly at the Youth Club Championships level and the local league level. Then we got to scrimmage together at the end because we were in a field house with a turf field which was an awesome way to debrief the conversation and just have fun with everyone there! Here's to the direction of change in Portland and hopefully one day coming back for Clambake!